On December 7 the US Supreme Court heard oral arguments in Free Enterprise Fund v. Public Company Accounting Oversight Board and Noel Allen, as NASBA counsel who had submitted an amicus curiae brief in support of the PCAOB, attended the session. 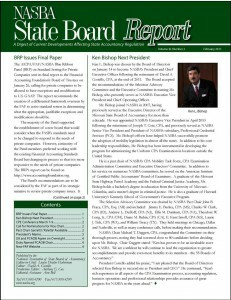 NASBA’s amicus brief can be found on www.nasba.org. Previously, the Free Enterprise Fund had lost their case before both a district judge and an appeals court; however, they continue to argue that the PCAOB violates the Constitution’s separation of powers provisions because the PCAOB’s members are not directly appointed or removed by the President but by the Securities and Exchange Commission. The Court’s decision will not be released for several months. It could result in no change to the PCAOB, or it could result in a change in the President’s relationship to the PCAOB, or it could just end in a ruling that the petitioner’s claim is not proper for the Supreme Court to decide.